Every parent has those embarrassing days when our children disappoint us. I endured one yesterday,but on reflection I may be more disappointed in myself. Teaching your kids to respect you, themselves, their siblings and others is a valuable life lesson. However, there are situations where your embarrassment can cloud your judgement. What if you punish your child and find out that their only mistake was being in the wrong place with a friend who does not share his sense of respect? On the scale of things kids do that annoy people, knocking on doors and running away is probably not that horrible. 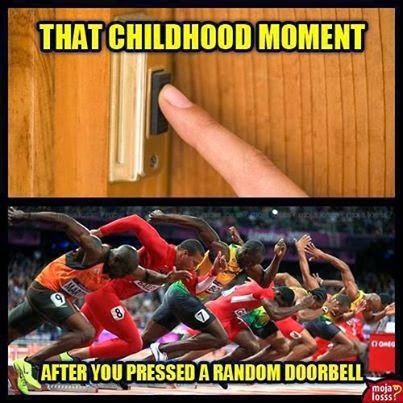 Many of us participated in such childish behavior or were dared into ringing a door bell or two. Playing around with your neighbors ringing their doorbell and laughing at them cussing around trying to figure who did it while hiding behind the bushes or the corner of the house is a time honored prank. I do not condone it, but many of us have done it. So, what happens when your kid tells his buddies not to ring the door bell and torment a neighbor and that friend decides to throw a soccer ball on the neighbors roof instead! I expect you would run like hell - which makes you guilty by association. I overreacted to a situation like that because I was embarrassed that my son would behave in such a disrespectful way. I thought the ball(s) were being whipped at the side of a house, not at the roof. I thought the gang of three were working in concert - turns out that they were not. Than of course there is the embellishment of the events by others. I marched the boys over to the house to apologize and than discussed a suitable punishment. I believe in being stern and sticking to your punishment. Taking away the things a kid likes most until they can prove to be a nice, respectful son works. Sometimes I will throw in a few extra chores, alone time and a sincere apology. Follow through can be the hardest part. I have to remind myself that whatever you say you are going to do, do it. I can't beat that feeling that my boy got a raw deal and I should have gotten to the bottom of what occurred before passing judgement. We both learned some lessons about perception, reality, friends and assumptions. If I had been in his shoes, would I have waited around for the person to come out their front door to see what the racket was and rat out my buddy? Nope, I would have hightailed it. How do I justify punishing him for not knowing better when he obviously did? The joys of parenting, there is never a dull moment!